When I was child, I always said that one of my hobbies is writing. I don’t really get what does it mean actually. I just think that if I say my hobby is writing, it sounds so cool. Like an author, writer, or whatever. I don’t realize it, that writing is my hobby. I like to write. I like to write since I was maybe in high school. Just write something that I really want to write. Most of them are what I want to get, like a short term plan. Since I was in college and had my own Sammy (my laptop), it makes me regularly write. Write about something that I saw before, something that suddenly came up in my mind, about things. I write lots. Usually I write and just save it in Sammy. But since 2012 I write and publish in my own blog. I don’t care if no one read my articles. I just love to write. Mostly write about social things or something I’ve done before and just want to share in blog. I never write poems, because I don’t know how to make it and I don’t have good sense of it. So, just write another things. I wrote about my country from my point of view, wrote about Indonesian characters, wrote about beautiful things here, and many more. And now, I often write in English, in case my friend can read my writings. But it depend, if I want to show “the feeling of Indonesia”, I just write it in Indonesia using “Indonesia banget”. Apa yang terlintas dipikiran jika mendengar kata FrontSummer?? Jadi gini, kenalkan member disini ada sekitar 18, meskipun yang aktif hanya beberapa saja tapi yang lain juga masih bisa menanggapi obrolan. Ada aku, Sopi, Parul, Desi, Adi, Ajes, Tutut, Rina, Icha, Nisa, Yulinov, Yuliarti, Ida, Livia, Yayun, Pratiwi (paling ndak aktif nih). Jadi kita bersekian ini selalu mengobrol dan memulai dari, “Rekk” atau “Tes”. Dari “tes” akan ditanggapi menjadi “tis”, “Tos”, akhirnya menjadi lengkap “testosterone”. Nah lo! Terus lanjut, tiba-tiba obrolan jauuuhhh dari bahas penting-penting kayak kerjaan atau beasiswa langsung cuusss menjadi “Rek aku belet pup”. Ok, obrolan nggelambyar lagi deh. Bahasan kita lengkap. Dari mulai basa basi sampai emang basiiii banget, sampe yang serius kayak beasiswa, nikah, kerjaan, perbankan dll. Yang paling sering kita bahas itu soal hape ato gadget because we have the king of that things, let say Fachrul and Ajes. Kalo ajes sih lebih hobi beli hape hehehe. Dan kalo bahasan udah memper kearah seksologi, biologi, budaya dan bahasa, sampe bahas yang kadang paling tabu pun, gue ma sopi sering duet. Sampe gue pernah tipo yang fataaalll banget dan paling gue inget banget. Ada juga nih si Smart costumer yang hobinya bahas hape apa yang paliing bagus karena dia mau beli hape, pertanyaan yang sama selalu dia ulang dari beberapa bulan yang lalu dan berakhir dengan kegalauan yang akhirnya tak kunjung membeli hape, Tutut. Rajanya typo, kita punya Desi ma Fachrul. Tapi setiap omongan bijak bisa keluar dari seorang Desi yang membuatku menjadi lebih open minded. Setiap kali omongan serius tiba-tiba ada split disananya, pakarnya Adi. Dia juga (menurut gue) yang paling mesum dan frontal hahaha. Ada makanan enak yang baru aja selese dimakan ma calon suaminya terus dipamerin ke kita, hobinya Icha. Ada juga yang let it flow, tapi kalo udah galo tingkat kreatifitasannya meningkat pesat, Nisa. Ada yang newbie disini, tiap obrolan nyeleneh dia muncul dengan bahasa kedaerahannya yang masih krasa, Ida. Ada lagi nih yang tiba-tiba aja nongol dan Cuma nongol kalo lagi bahas urusan perbankan, Yayun. Ada lagi yang menanyakan hal tentang “biologi” yang sebelumnya udah pernah dia tanyakan tapi ditanyain lagi gara-gara lupa dan juga lebih hobi kompor-komporin bahasan grup, lets call Rina. Or...let say she is a GPS of Pasar Besar. jadi kalo mau ke pasar besar, cukup tanya Rina aja lokasinya. GPS ala rina akan segera on dan memberikan informasi akurat. 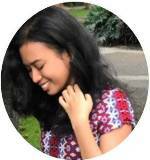 Yang tiba-tiba muncul dengan pertanyaan “Haruskah aku mempertahankan yang lama atau memilih yang baru?”, Livia. Yuliarti muncul dengan pertanyaan “Rek, SMK sekian di malang itu bagus ndak”. Yulinov, selalu meramaikan suasana yang udah “terbakar”. Hati-hati dengan para pacar, terutama laki-laki. Karena akan menjadi konsumsi publik grup ini. Bahkan direbutkan dan akhirnya jadi bingung. Bener-bener brasa direbutin, dilempar, ditukar, direbut lagi. Apalagi yang ngerebut si cowok-cowoknya hehee. Android based - Smartphone or tablet are familiar in our lives now. People still keep in touch although thousands miles away apart. Many kind of applications that can connect us with other people, such as Line, WhatsApp, Kakao Talk, and many more. I know those applications offered by smartphone make us feel easy to do many things with our smartphone. The first time when I got my smartphone, I said “Sophisticated”. Yeah that’s right! Sophisticated. I can do many things with my smartphone, I have all my teaching materials in it, I can surfing easily and faster, I can talk to other people by free phone using application, I can share my pictures easily using Instagram (since I like photography), if come to new places I can’t get lost or deceived by taxi driver because I have my GPS hehe. One day I got problem with my smartphone, it can not be turned on and it makes me frustrated. Why? Because I have class and my all materials teaching in smartphone.Ohh,, really I can’t live without my smartphone. My mom said that my smartphone and Sammy (my laptop) are half of myself haha. That’s true mom. See, there are many things that smartphone can do, and of course help us. Give us many things that we can’t imagine before. the newest type will increase the capabilities. Of course, the developer will make it more and more sophisticated. But there is something that maybe we forget. Maybe we’re getting excited with smartphone and forget that we are a human too. We’re human being, need to say “hi” to other people too. The real “hi”, not just say “hi” by phone. Maybe we can say hi by phone if we are living far each other. But what if we live in same place? I mean if we go to somewhere together, we often play with smartphone rather than talking with friends. Sometimes we play on facebook, twitter, or others while going out with friend. Ok, let say, friend still have other things to do, but it’s pathetic when see family going out to eat and dad, mom, even kids play on their own smartphone. They weren't talk each other. They just talk with their own smartphone. So if I see those, I just see mom dad and kids out together, order foods, and play with smartphone while waiting. Doesn't look like family, just look like a man, a woman, and kids eat together in same table without knowing each other, or maybe "who are you?". I mean, if family going out together, just make it become quality time with family. Maybe parents busy at work and kids busy at school, so they out and make a good time. But unfortunately, the gadget make them far away. They stay close, but far. If you know what I mean. Smartphone hmmm something that we can’t avoid for now (actually for me hehe), but don’t forget that we are human being and we need to communicate with human and living being. It’s ok having smartphone that help us, just don’t let our smartphone take control our real life. Our lives too precious to taken over by technology. 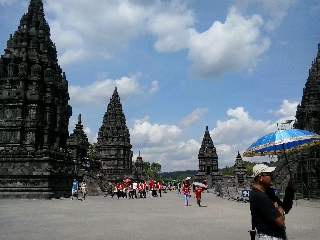 Prambanan, who doesn't know this temple? Indonesian for sure know this temple. 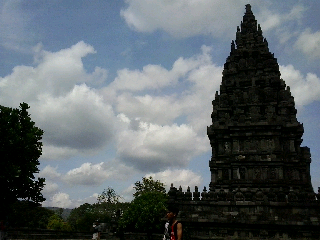 This Hindu's temple located in Jogjakarta. This was built thousand, maybe more, years ago. Long long long time ago. About 9th century. There is legend about that, people usualy said about Roro Jonggrang that ask thousands of temple to a man who love her but she doesn't. I dont know about that legend, and let it be a legend behind that amazing temple. What I want to say here, about that amazing temple. How come they can built that kind of amazing things? Those are stones. Stones. Very heavy stone. And also there are relief in candi's wall. It has own stories and it's different each others. So, I still can't imagine how great people at that time. 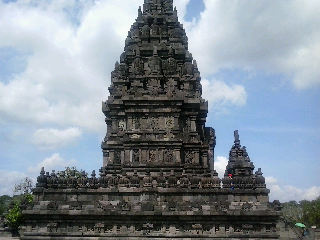 Think about something, maybe people can build a house easily, but how to built candi using stones? Still can't imagine about that. They have something to tell from past. We can see how great that kingdom and people there. Hmmm... Maybe this is because I like to know about history especially history things that happen in my country. Still, amazing for me. Great sculpturing from the past.